I am pretty pleased with myself for having finished my Scrappy Grandmother's Flower Garden Quilt. 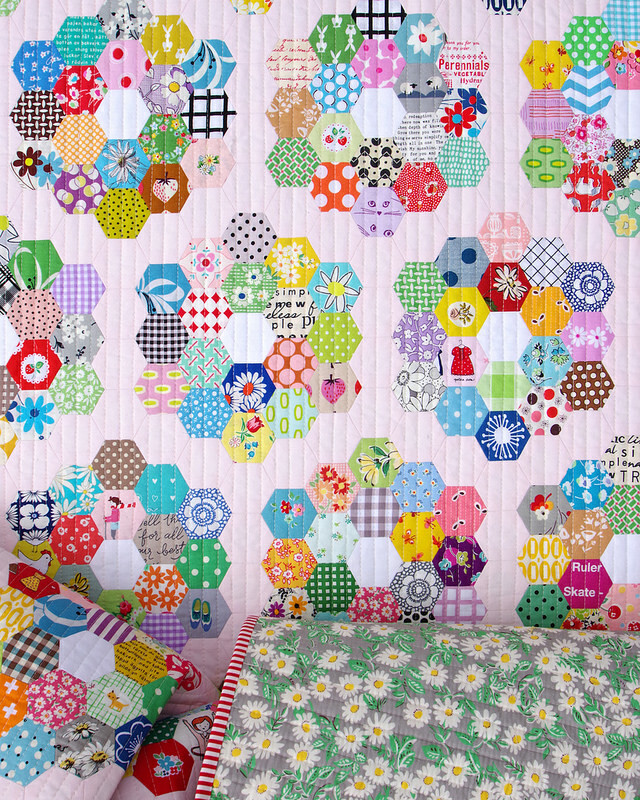 I have so loved working on this quilt, from sorting through my fabric scraps and stash, to cutting hexies, glue basting fabric pieces to papers, and stitching hexagon flowers, to finally basting and quilting this quilt. It was a journey that played out over many long evenings with needle and thread, and one that I would happily repeat. I have lots of photos to share so please do bear with me! I finished this quilt top in July and for all of the month of August the quilt top sat neatly folded in a corner of my sewing area. I couldn't decide if I should send it off to my long arm machine quilter or if I was game enough to tackle the quilting myself. Yes, I still worry with each quilt that I could mess up the quilting, especially so with larger quilts. Earlier this month however, I threw all caution to the wind and basted the quilt one afternoon, and started quilting the next day. And I am so glad I did! I love the simple straight lines of quilting! The lines are spaced ½" apart and run from top to bottom edge of the quilt. It took hours and hours of slow stitching and quilt wrangling to complete the quilting but it was well worth the effort. 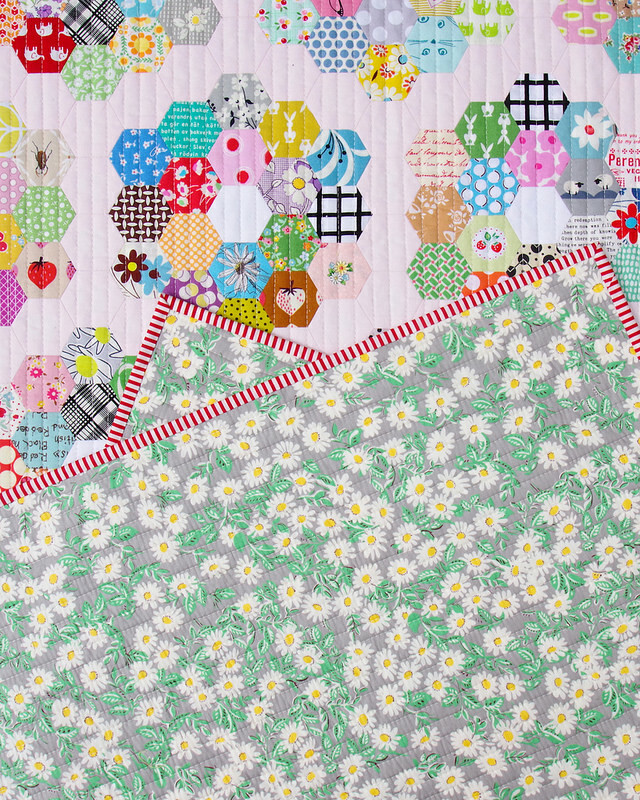 For the back of the quilt I have used a single white daisy design on a grey background. This is a Japanese fabric and the selvage reads: Favorite - Presented by Kei Fabric. I had been holding on to this piece of yardage for just the right project and this was it! And I have finished the quilt with a red/white stripe fabric for the binding. Having spent so many hours hand piecing the quilt I thought it only appropriate to spend an hour or so hand slip stitching the binding. The finished quilt measures 55 inches x 72 inches. Started: May 2018 Finished: September 2018. 1 Inch Hexagon Template with 3/8" seam allowance. 50 WHOLE Scrappy Grandmother's Flower Garden Units (pictured on the left). 8 HALF units for the left and right edges of the quilt (pictured on the right). and similarly end row 9 with a whole Flower Garden Unit. (see photo of the whole quilt for guidance). individual row in a Ziploc bags. and as pictured below for left and right side half Flower Garden Units. 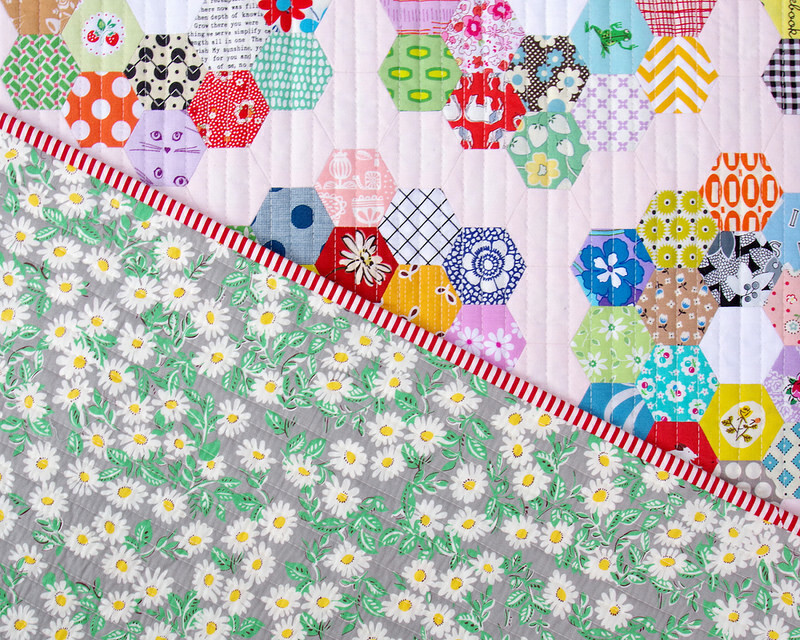 and 4 half Flower Garden Units for the RIGHT side of the quilt). units for the whole row, sew the row together. Then join together horizontal rows. to be added to fill in the top and bottom quilt edges. 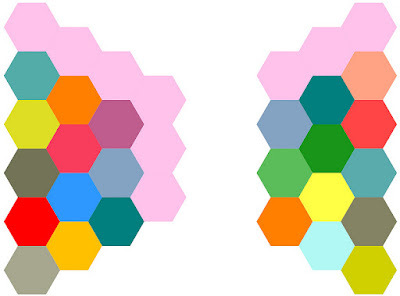 sides of the hexagon have an adjoining hexagon. A total of 1572 - 1 inch Hexagon Papers. 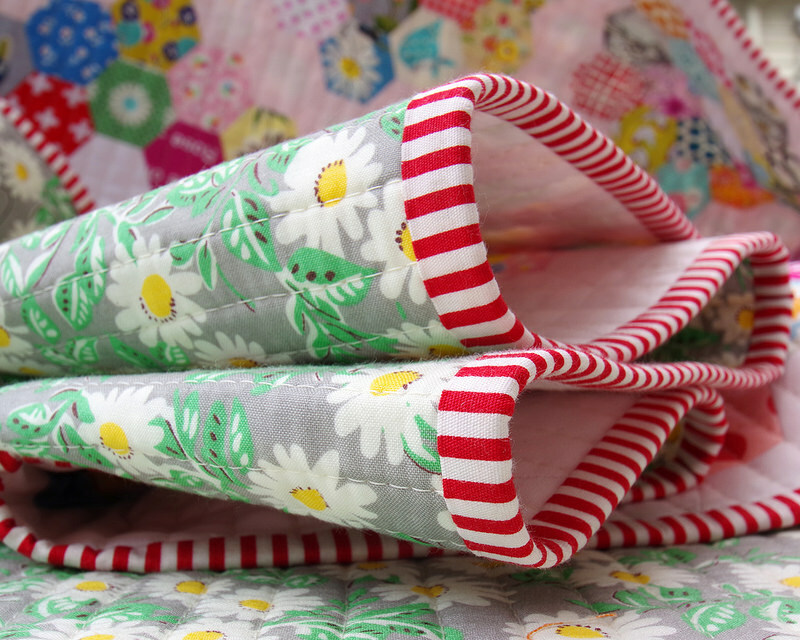 Scrappy fabric for Grandmother's Flower Garden Units. 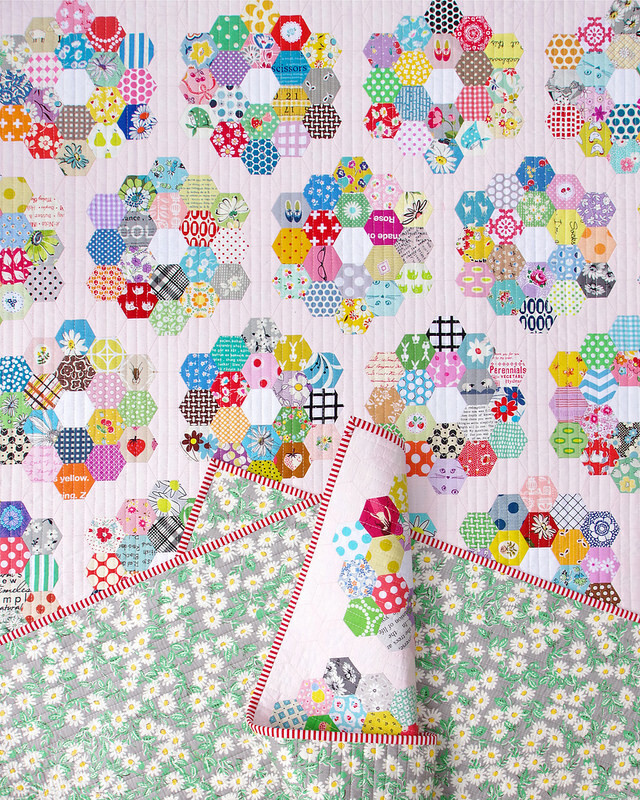 3 YARDS of background fabric* based on cutting 1" hexagons with 3/8" seam allowance - standard width quilting cotton (cut a total of 526 background fabric hexagons). *I have used Robert Kaufman Kona Cotton in Ballet Slipper for the background fabric of my quilt. I hope that all makes sense? Please don't hesitate to email me (redpepperquilts@gmail.com) or leave a question/comment below if you have any questions or require further clarification. What a treasure - I loved all the photos! Beautiful! 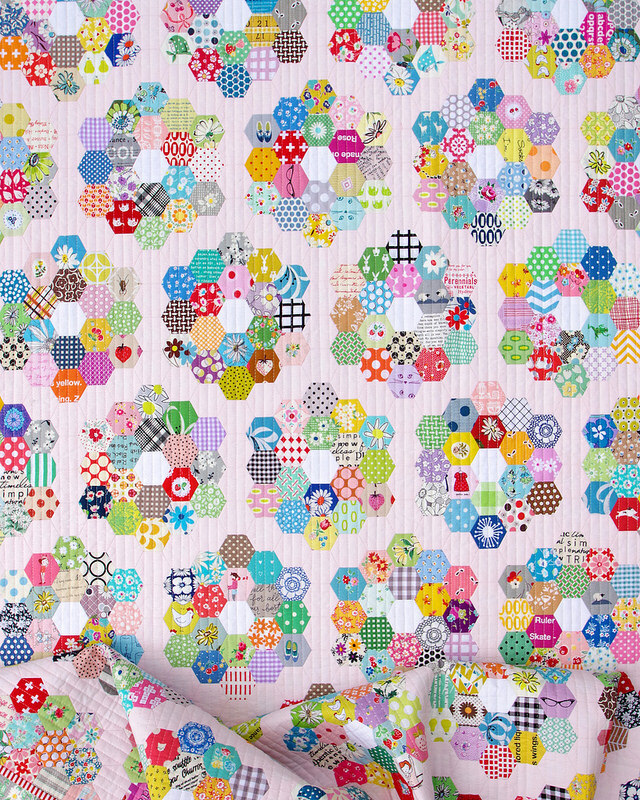 You inspire me to start EPP and make this quilt. I have arthritis in my hands and will just have to try. I hear making hexes is addictive! I love it! So far I have only made a runner with the hexies and started out by hand then switched to machine. You have a lot of patience! Rita, this quilt is gorgeous! 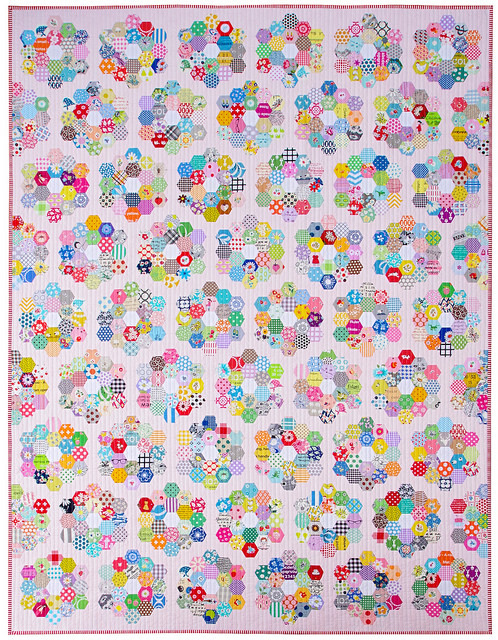 You have such a wonderful way of choosing colors and patterns that work well together, and this quilt showcases all of your talent and skill in piecing and quilting that goes so well together. A beautiful quilt, I adore it. I hope to try making my own scrappy grandmothers flower garden quilt one day.I'm a beginner at EPP, thank you for the inspiration. I love this quilt and hope to make one just like it someday. Thank you for such a wonderful post and helpful photos. The quilt is spectacular. Oh, if I could sew like you! I love everything you make. 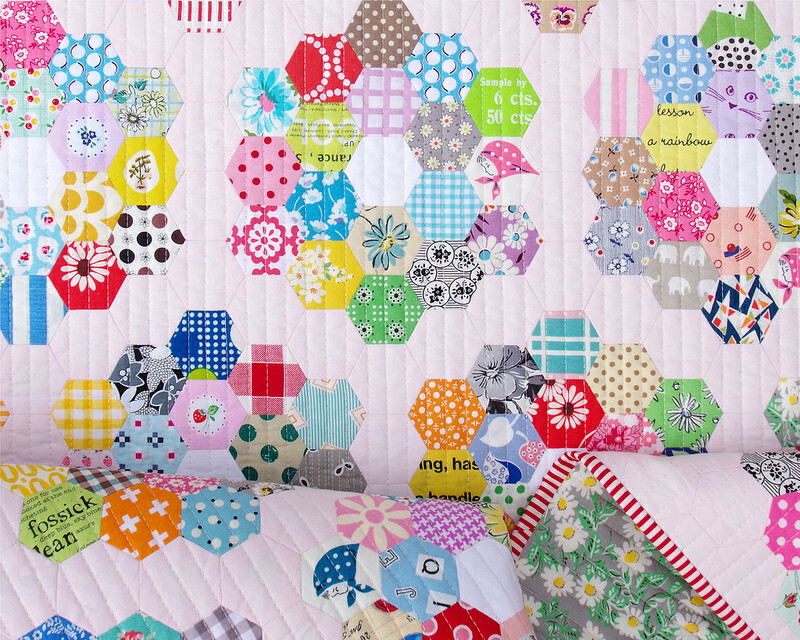 Gorgeous quilt Rita! 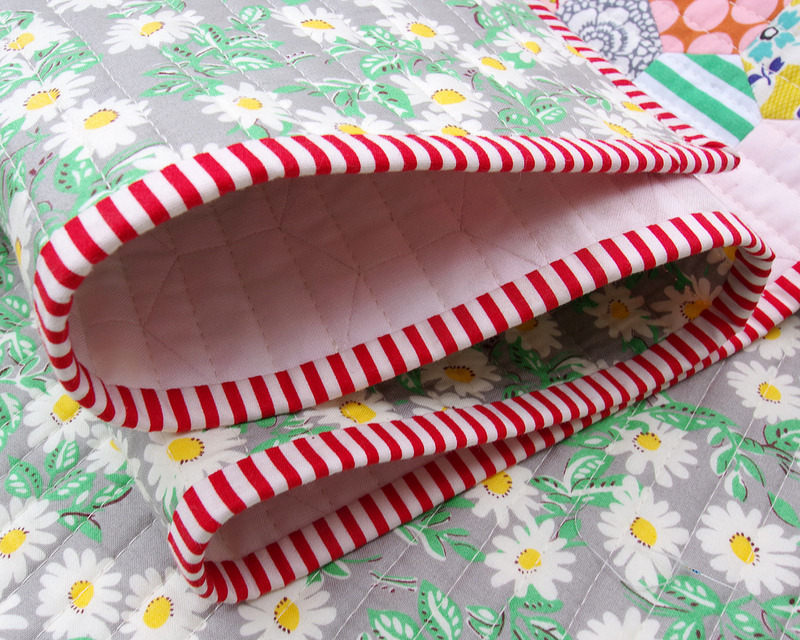 Love the backing fabric and the straight line quilting perfectly finished. Beautiful and I can only imagine it was so much work! Wow, wow, wow! It almost looks like a charm quilt, but I think I see a few repeats. Absolutely beautiful! 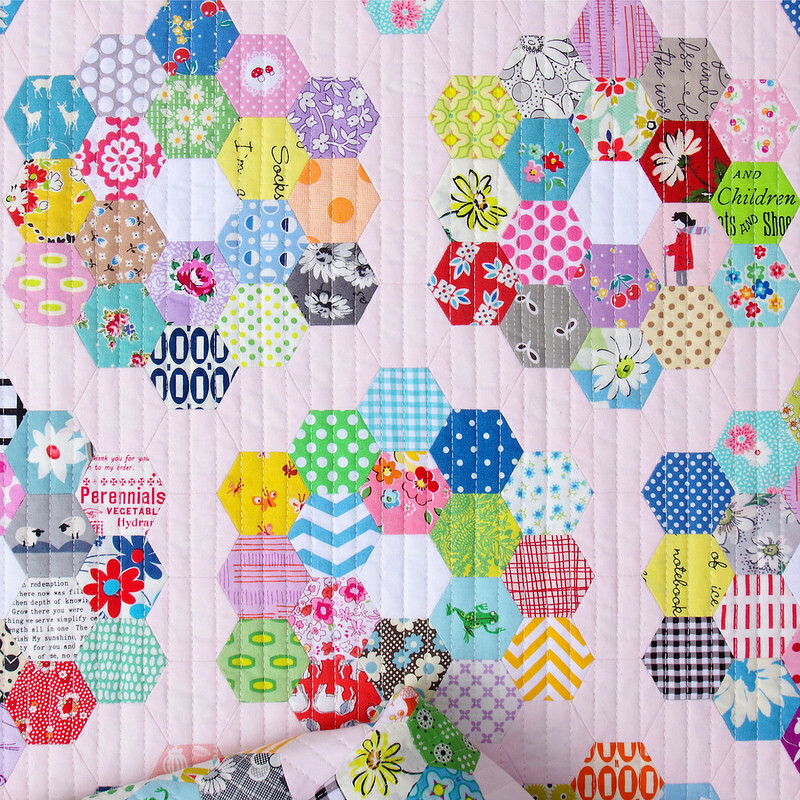 From the scrappy hexies to the Kona pink background to the gorgeous backing (daisies are my favorite!) to the striped binding...everything is so lovely! Rita, this is really a personal accomplishment. I am sure you can look at each section and recall the process of that portion... what you were thinking. I know I do, okay, maybe just me. 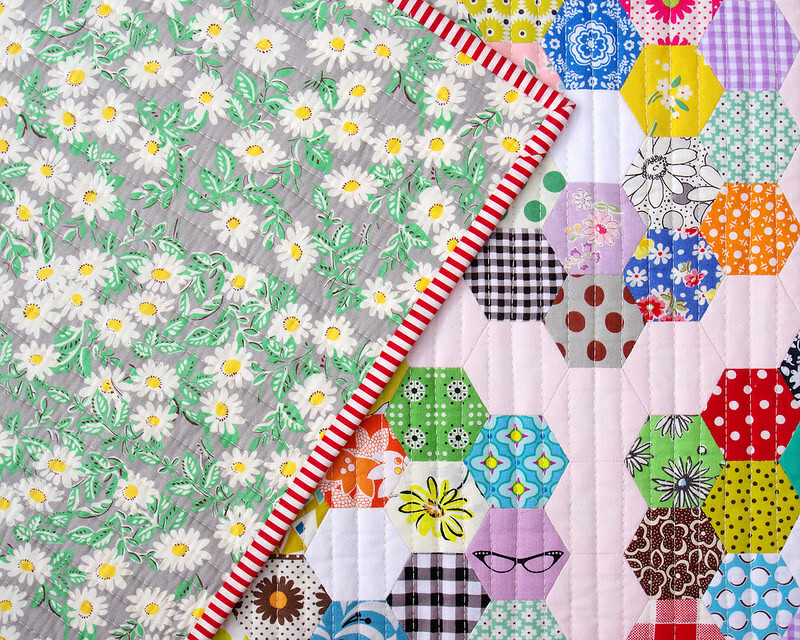 I have jumped onto the hexie wagon, and now I have two intense quilts I am working on. One is Facing East (a little stalled to throw together two baby quilts) and the Kingfisher stitch along. That group is all done and over, but that is what got me pulled in. 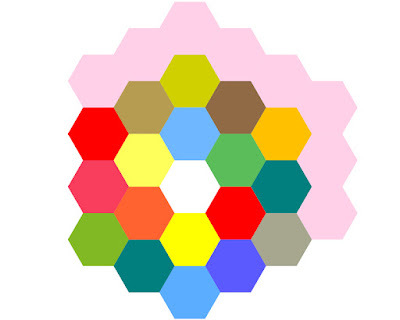 Now I am a hexie making fool. I am wondering, is it rude to take sewing along visiting others? I think so. 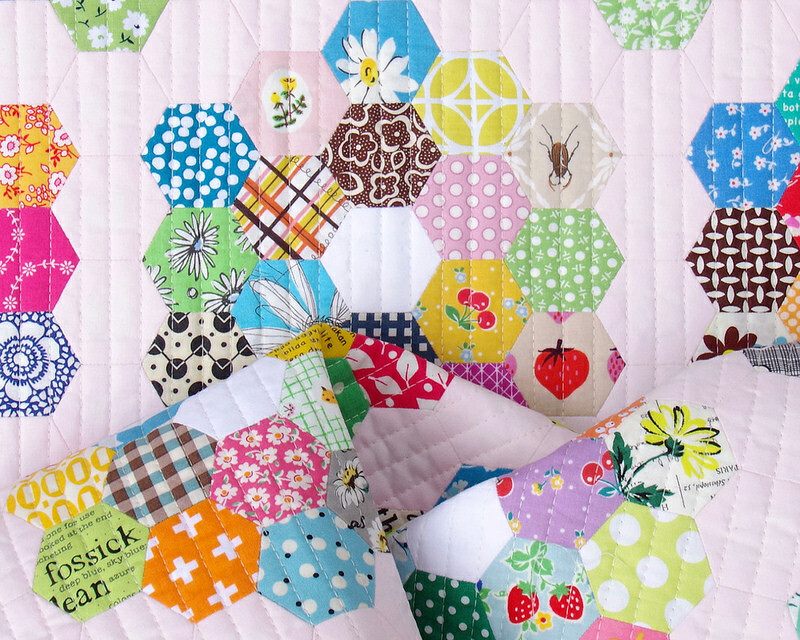 so far I have not Honestly, I do think about making hexies when I am visiting. Gorgeous Rita! I hope you're keeping this one. This so amazing! Thank you for the tutorial! Hi Rita! I can't tell from your description if you hand quilted it, too? 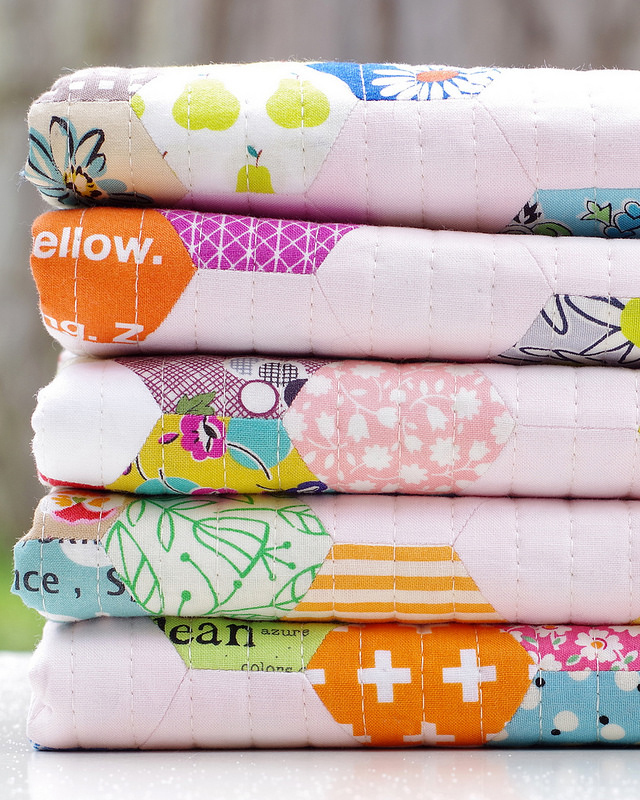 Have you ever tried hand quilting? Your strip-piecing postage stamp quilt was my first ever quilt. Then I quit my machine and went EPP for #2 and #3! This is Amy, by the way. Jeremiah is my hubby. WOW, you are FAST! I'm a quilt dawdler, slow, and not so sure. Projects get inspired, started, and set aside for months on end. 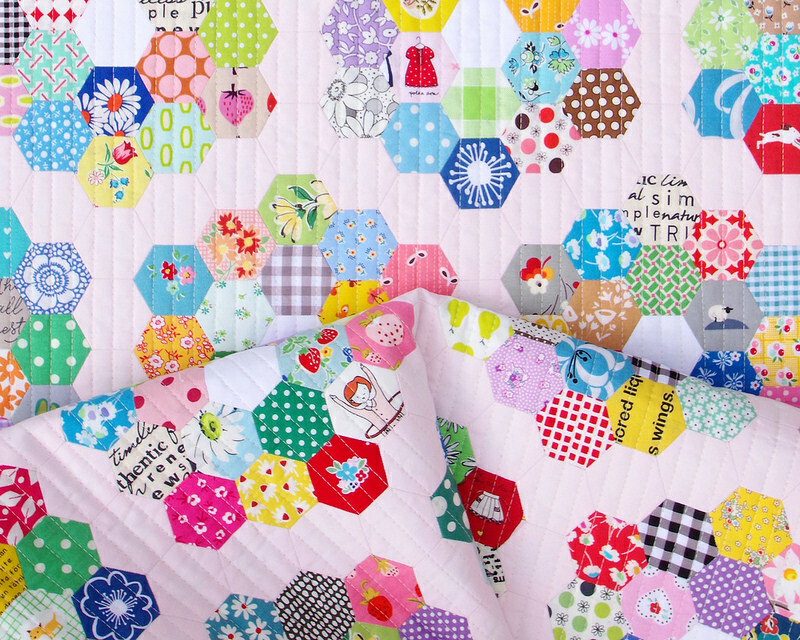 You are a fast hand piecer, and a fast quilter! it's gorgeous! i love the double ring of petals for each flower - a nice twist to such a classic design. perfect backing choice too! It's lovely Rita! Well done. 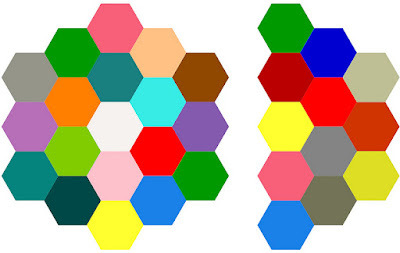 Thank you so much for your diagram of how you put the hexagons together. That's a lot of help for me when I start on mine! Hopefully soon!